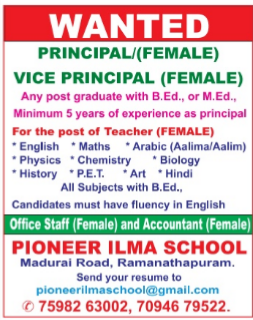 Pioneer Ilma School, Ramanathapuram has advertised in THE DINAMALAR newspaper for recruitment of Principal,Vice Principal,Teachers,Non Teaching Staff's jobs vacancies. Interested and eligible job aspirants are requested to apply immediately.Check out further more details below. Name of the School: Pioneer Ilma School, Ramanathapuram. About School: Pioneer Ilma School is the 1st and ONLY Islamic School in Ramnad offering an Integrated and Holistic Education. (a) Principal/Vice Principal:Any post graduate with B.Ed., or M.Ed. Minimum 5 years experience as Principal. (b)Teachers: All subjects with B.Ed.